This year marks the 900th anniversary since the founding of the medieval Knights Templar. While the exact date is debated to this day, it is believed that sometime in 1119 (most likely toward the end), Hugh de Payens and a contingent of knights established the Poor Knights of Christ and the Temple of Solomon, also known as the Knights Templar; according to William, Archbishop of Tyre, it was nine knights while Michael the Syrian, Patriarch of Antioch, spoke of thirty knights. The Templar first received recognition from Baldwin II, King of Jerusalem, and Warmund, Patriarch of Jerusalem, which would occur in January of 1120 at the Council of Nablus. At the Council of Nablus in 1120, Warmund donated some land to the Knights Templar and the King gave the knights the Stables of Solomon as their residence as well as some villages. The Templar order wouldn't receive papal recognition for a decade, by Pope Honorius II, and then, in 1139, Pope Innocent II issued Omne Datum Optimum, Latin for "Every Good Gift." This papal bull allowed the Templars to keep their spoils of war, placing donations directly under papal protection, and exempting them from paying tithe. This proclamation added a priest class to the hierarchy as well as making the members of order answerable to the Grand Master. The Order was governed by what is known as "The Rule" which was written by St. Bernard of Clairvaux, nephew of Andre de Montbard who was one of the founding knights and future Grand Masters. The Rule covered all aspects of the life of the Knights Templar. The Rule included topics such as knight renouncing his former life and property, dress, eating, prayers, the hierarchy of the order, penalties, conventional life, penitence, and the manner of his reception into the order. The Order became very popular among the European nobility and would exponentially grow in numbers and wealth with a presence across Europe and the Levant. 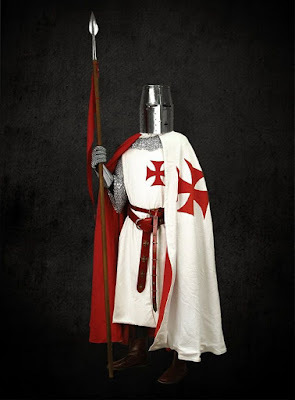 The Templars would become known for their protection of pilgrims to the Holy Land while also being known for their impact during military operations. They would be mythologized by their financial acumen as well as their downfall in the 14th century culminating in the martyrdom of Jacques DeMolay. Even today there are many theories and myths about the order before and after their suppression by the French king, Philip. The Templars became associated with the rise of Freemasonry, the Holy Grail, alternative theories on Christ, and occultism. For this anniversary, I am working on a series covering the timeline of the Templars as a commemoration to this Christian knighthood.